The team behind the recently restored Vulcan Bomber has said the aircraft could be grounded forever unless further funding of £1m is guaranteed. 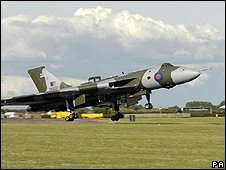 The aircraft, which used to be at RAF Waddington in Lincolnshire, took part in several displays in the summer but the project is now running out of cash. The Vulcan XH558 flew back to its base at Bruntingthorpe in Leicestershire last month. The team said it might not fly again unless money is pledged by early 2009. In a statement the Vulcan To The Sky team said: "The funding will allow the project to pay its monthly expenses, clear debt and provide a stable financial footing for the future. "The Vulcan XH558 returned to flight in 2007 and has been the unquestionable star of airshows throughout the summer - entertaining a combined audience of around 1.5 million people. "Even a relatively small monthly pledge is a significant help. If 15,000 supporters were to pledge just £4 per month then (with Gift Aid) the target would be met." In October the team petitioned the prime minister to ensure funding to keep it in the sky. Last year the Cold War aircraft flew for the first time since a 15-year, £7m restoration project in Leicestershire. But the team has faced continued funding, weather and technical problems. Some 20,000 people have contributed to the restoration fund for the bomber.